It seems that gardeners can’t get enough of Seasol, the new and exclusive seaweed concentrate plant tonic from Mr Fothergill’s. Mail order sales of their new 4ltr sized pack have exceeded all expectations and currently sit top of their best sellers for early 2019. 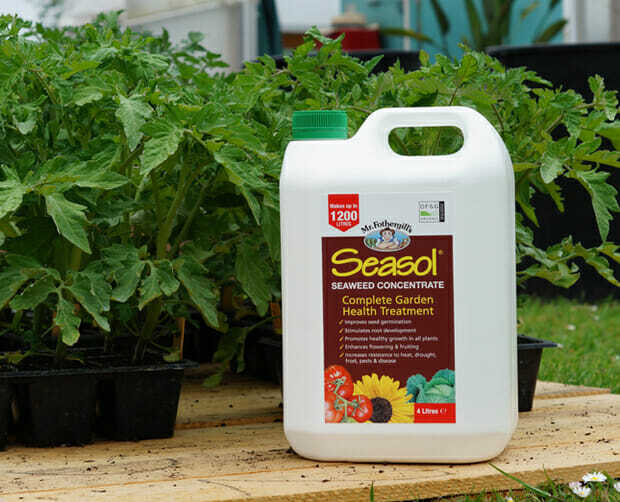 Exclusive to Mr Fothergill’s, Seasol seaweed concentrate is an all-natural plant tonic, offering a complete treatment for all areas of the garden, promoting healthy growth of plants, flowers, vegetables and even lawns. It contains useful micro-nutrients and is rich in trace elements. Used regularly, the concentrate has been proven to provide excellent chemical-free plant nourishment. “Gardeners have really taken to Seasol and the new 4ltr size is proving a real hit” says Paul Pates, Head of Mail Order for Mr Fothergill’s Seeds, “It’s a fantastic product that really does work and the new size is very cost effective, making up to 1,200 litres of tonic for only £19.99 – enough to cover over 500 square metres!”. As well as being watered directly into the soil for uptake at the roots, Seasol can also be applied as a foliar spray for fast absorption of nutrients. What’s more it’s chemical free and completely organic! The new 4ltr size is available from www.mr-forthergills.co.uk and is priced at £19.99 with a 1ltr offering priced at £7.99. It also features in the new Mr Fothergill’s Seed catalogue which is available online or by telephone 0845 371 0518.